The Anami coastline is a central part of a 110 kilometer area recognized by the World Geological Park Network. 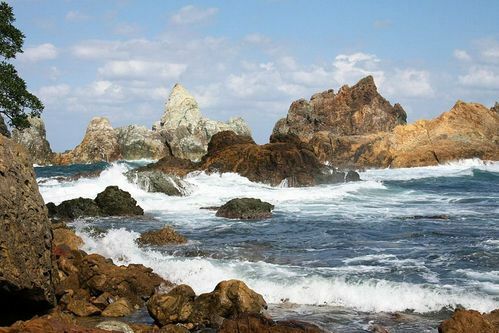 The normally calm sea is rough in this area, providing a dynamic and rare view of the Sea of Japan. There are many reasons for this, one of them being the steep rocky coastline and beautiful natural rock formations. 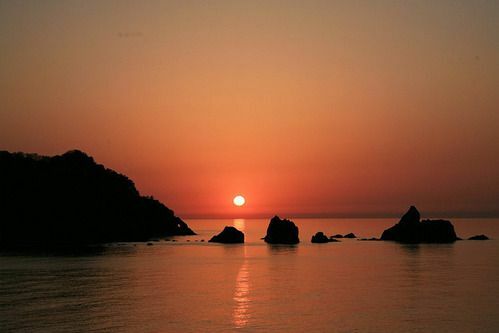 Spanning from Tottori, the coastline has beautiful mountains and ports, making it an ideal location to catch a sunset. Just past the park is the Ryujindo, where a mythical dragon is said to be enshrined. It is a guardian deity for the fishermen of Igumi and every year there is a festival on November 10. At the entrance of the park there is a monument to the local poet Nishimura Tadehana and a monument to Okagaki Tetsuji. Also, along the beautiful mountain road in the Igumi area of Shin-onsen, there is an observatory where you can see the port and mountains. If you have a chance, please take a drive and enjoy the view from this spot!